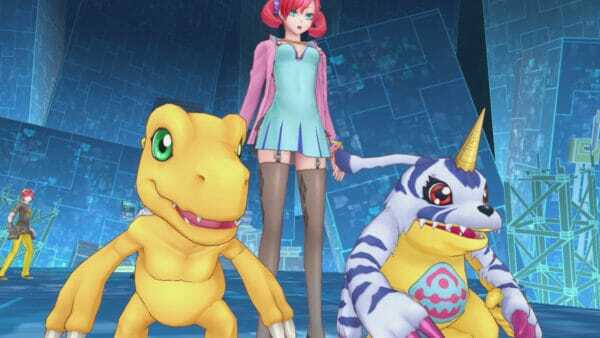 Due to the newest Digimon game releasing on Friday, Digimon Cyber Sleuth: Hacker’s Memory this is probably the best time to introduce a ranked list on the subject of Digimon games. The Digimon franchise is something that’s very near and dear to my heart. 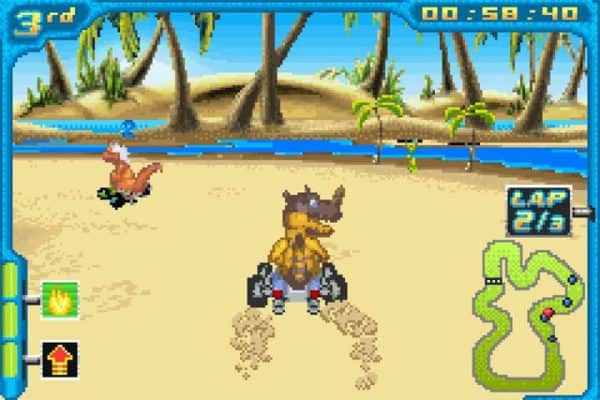 I actually did have the second and third series of the Digivices, but I played with them here and there. Mainly because the Tamagotchi craze was happening and this was sort of the boy version of them. However, like most kids, I was drawn to something because it provided a great visual medium. Also, because if something wasn’t cartoons, video games or sports, it did not really hold my attention very long. Growing up in the 1990’s, only certain Japanese anime, which usually had an appeal to children, were shown on television here. So, most of what we got was American cartoons. Then, enter Pokemon and that changed the scene for a whole lot of things in the United States. Especially, once the success of the Pokemon games gave way to the only slightly less popular anime. Suddenly, many other shows like it began appearing on American television. The sad thing for Digimon is that because Pokemon became mega-popular, anything that comes after it becomes an immediate imitator. Although, this is certainly far from the truth. 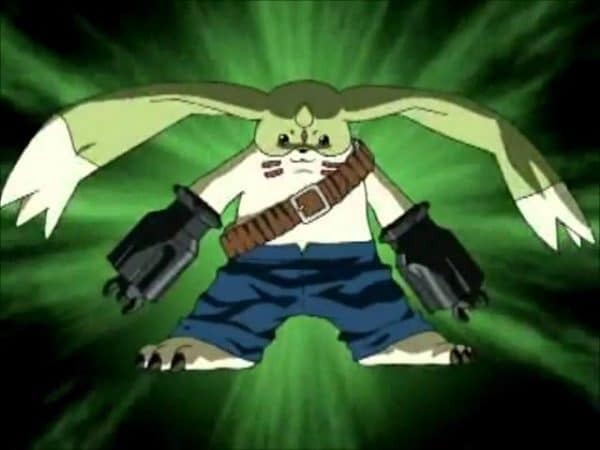 “Terriermon” as seen in Digimon: The Movie. As I outlined at the start, Digimon began as virtual pets. Although, I guess that’s like saying the Nintendo toy company, and the Nintendo video game company provided the same services. Pokemon beginning as video games helped give them bigger recognition. However, for me, the love began when the Digimon anime appeared on FOX Kids. The first season of the anime, back when you didn’t know it was called anime, dealt with a lot more mature themes than Pokemon did. It was also centered around a group of kids and their Digimon. The story, in general, also deviates into different things throughout its 50 + episodes. Pokemon generally follows the tale of Ash Ketchum and what he goes through, which is good in its own right. 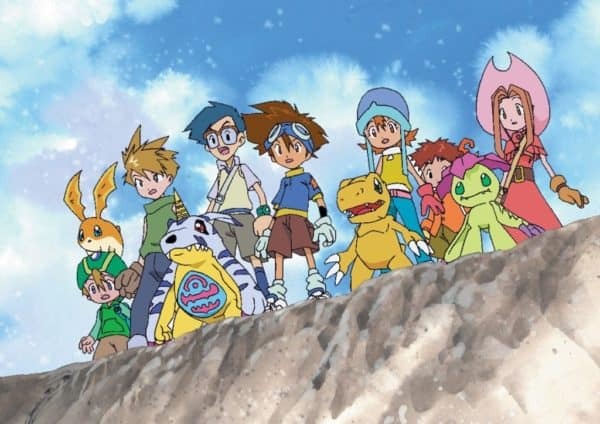 Just, Digimon as an anime with all of the digivolutions. The different characters and the wide variety of creatures. Plus, its interesting story captivated me as a kid. Something that Pokemon did as well, but I’d say that I cared more about the games than the show itself. Digimon not only wound up as my gateway to other types of anime. It also led to a lifelong care for the series. I watched every episode every weekend. Collected the trading cards. Researched their evolutions. And generally knew things about the creatures before the anime even got to that point. This led to of course watching the subsequent seasons of the series, and their movies. 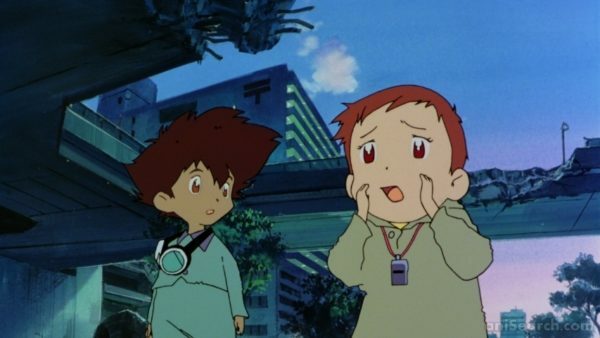 Honestly, what was great about the Digimon anime, is it wasn’t afraid to be more adult oriented. Something I felt that Pokemon did very sparingly. And I’m currently enjoying keeping up with Digimon Tri whenever they release new episodes. Going back to my childhood, I even made my Dad, who didn’t care one iota about anything involving animation, watch the first movie with me the whole way through. I also dragged my whole family to see the first Pokemon movie in the theater as well, but that’s beside the point. Well, I wanted to tell that whole story first, because I think any Digimon fan is willing to admit that video games have been a sore spot for the franchise throughout the years. There are way more games that either didn’t even release in the West or just weren’t very good at all. For that reason, it was not easy coming up with this final list. I had to figure out what it is I liked the most about the games, which games gave me any fond memories, and also which ones were actually good. So, my list may anger many purists. But, then again, these are all subjective, so it is what it is. Although I love Digimon as a whole and will give everything released with the name a chance, I’m also human as well. There are just certain games that I won’t play, or will ever get a chance to play. * Although I owned and played Digimon World 1 and Digimon World 2 on PlayStation 1, a combination of being both very young at the time, and also just not caring about pet-raising simulations. I’ve just never thought those were good games. For those that love the feeling of bonding, raising, watching them die, and doing it all over again, have at it. 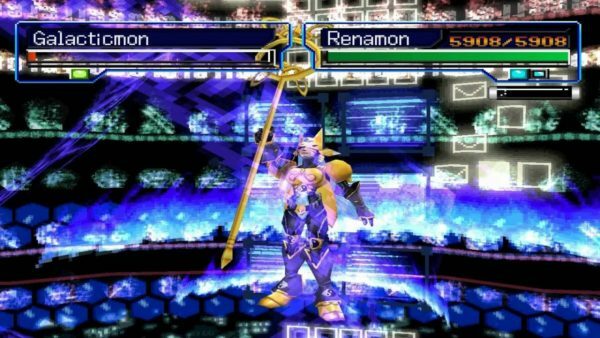 So, let’s get to it then, the actual Top 5 Best Digimon Games. Quite honestly, I was almost tempted to put one of the spin-off games here, and just not include any of the Digimon World games at all in my list. However, seeing as the PS1 titles are most folks first introduction to the Digimon games. I felt like there needed to be at least one on the list. 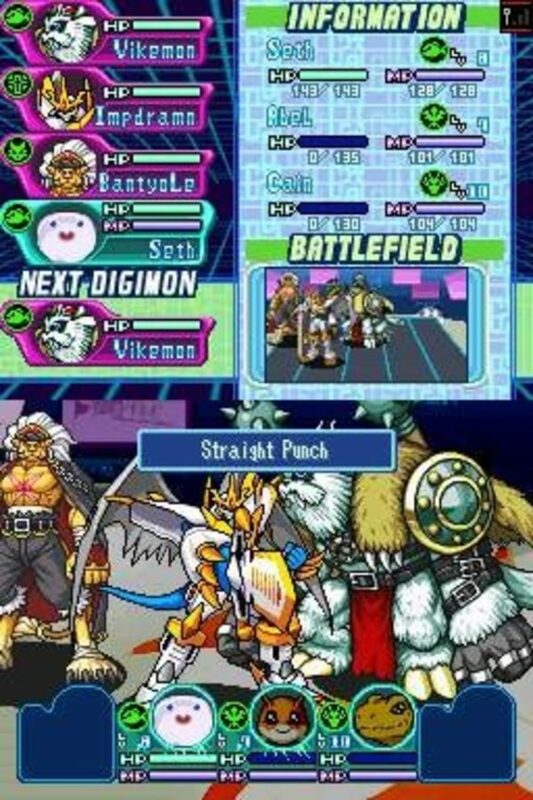 The first two Digimon World games leaned heavily into being more about pet raising than actual battles. Especially, since battling also mirrored that of the virtual pet. Where you could throw out items, or select their special attacks, but most of the battle was automated. This is something Bandai Namco went back to for last year’s I wanna say almost remake of DW1 called Digimon: Next Order for PS4 and Vita. 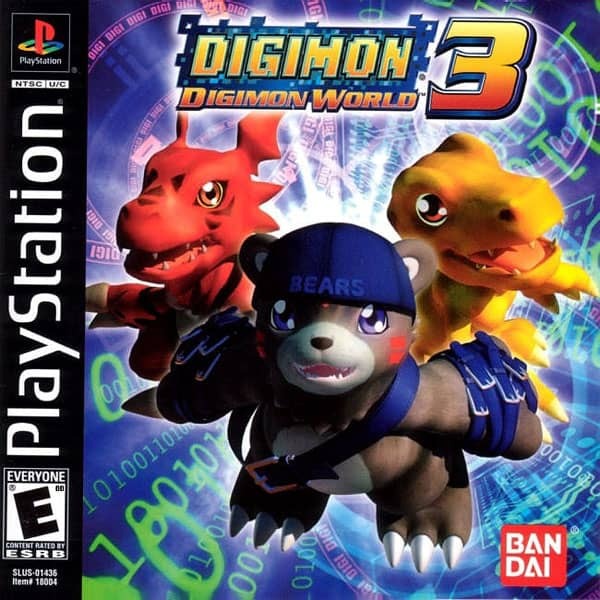 Then, Digimon World 4 went in a completely different direction with a co-op action RPG. While fun with some friends, the game was excruciating to play because enemies crowded you. Used cheap tactics and generally took the enjoyment out of the game away rather quickly. However, Digimon World 3 is more of a run-of-the-mill RPG and introduces the base system for later Digimon games. But in a rather unrefined way. After meeting the main character, Junior, you get to pick a selection of three Digimon and go try to conquer Digimon Online. The story even gets more convoluted later when an evil force enters the fray. Thus, revealing the true plot of the game. But, Digimon 3 doesn’t necessarily play nice all the time. the battle system is turned based but feels slow. So, this makes leveling them up annoying. Especially, at higher levels when the grind can get insane at times. I also remember having to heal a lot outside of battle, because you’d constantly have the luck of the draw, as to whether or not enemies would be over your level. 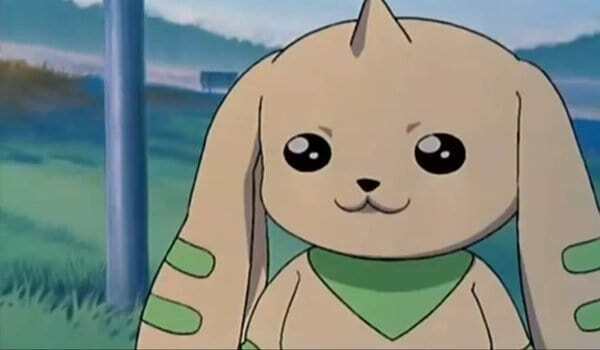 There’s also the disappointment that occurs when some of the Digimon you know from the anime don’t actually follow the same digivolution path, which you are used to seeing. In the other games on my list, this mechanic is explained very well, but in Digimon 3 it’s really not. However, what I wound up liking the most from this game is the 2D graphics when walking around. 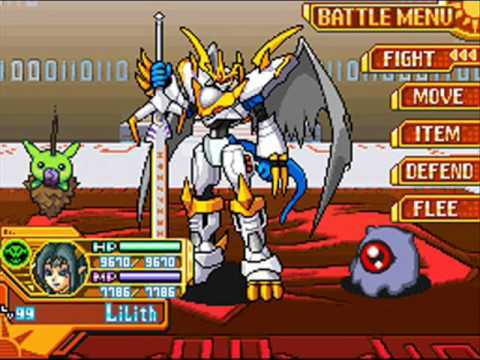 Honestly, for the first three Digimon games, the battle graphics were fine for that era, but do not hold up well. Another nice thing was the music, which actually had composers from the anime do some of the soundtrack. This game also had card battles, which to me, were at times a lot more fun than the normal ones. 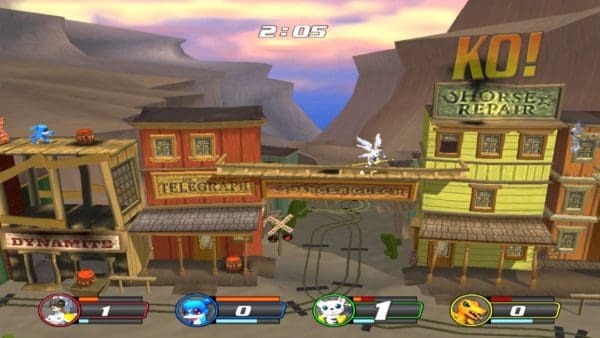 Simply put, Digimon Rumble Arena 2 is a Super Smash Bros. clone. The singleplayer experience just guides you through a certain set of enemies until you get to the end. While in multiplayer is where the game gets more fun. Although this isn’t a perfect representation of Smash. It doesn’t quite have the balance or polish of Nintendo’s beast. Luckily, I owned the Original Xbox version, so it ran better than the other two. The Gamecube version is particularly bad in this regard. One of the things you can laud about the game is it has a pretty nice roster. 40 Digimon in all, packed with their Digivolutions you’d recognize from the anime. 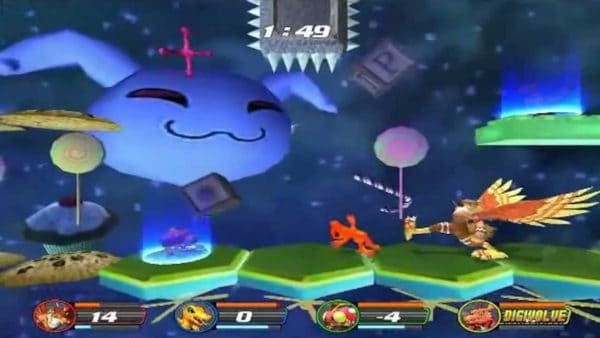 The nuance you’d find in Smash is also not here, but for just having a good time, this does the job. My younger cousin and I played this for a few hours on multiple weekends back then. But its very easy to spam attacks with certain characters. Especially ones like Renamon who could teleport. It is fairly easy to wail on your opponent without getting much resistance. Something which works for its intended audience. Also, the aspect of Digivolving seems cool, but for many of the Digimon its almost better just to stay in your Rookie forms. They are generally faster and more powerful that way. 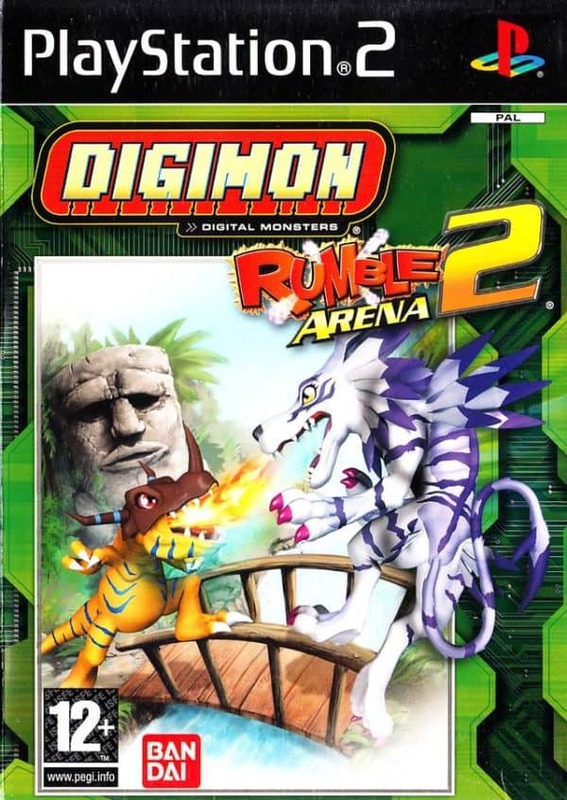 So, sadly that mechanic which makes Digimon special becomes neutered in Rumble Arena 2. Many of the arenas are interactive, so you could fall in lava, or parts of the level just get destroyed, as you battle. So, there are perils when going through parts of many of the stages. For the most part, this is the one game I have fond memories of from childhood. I’m sure, if I went back and played it now as an adult, it may not fare as well. However, there was just something cool about battling with all my favorites against friends. 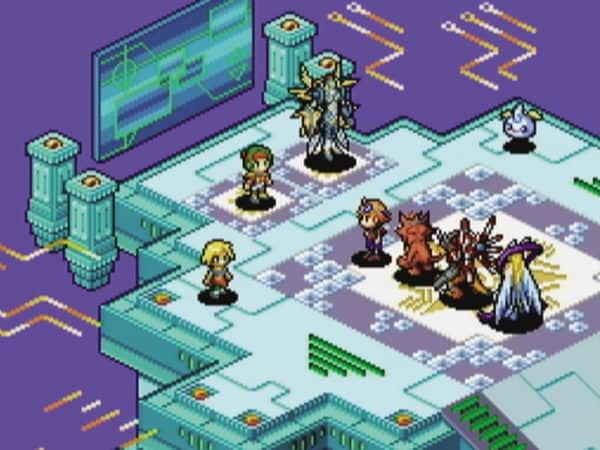 This is where the Digimon games began to take shape and many of the systems put into place in Digimon World DS, which exist in the current slate of Digi titles. Take, for instance, the act of scanning Digimon. Instead of using some kind of capture device, every time you encounter a Digimon a meter fills to a certain percentage. Once it gets to 100% you can then go into your DigiFarm and create that Digimon. The DigiFarm itself is not revolutionary, but for this series, it makes training Digimon so much easier. You can have up to four farms, feed the creatures, decide how they train, and also leave them alone while playing the main game. The top screen of the Nintendo DS also helps you keep track of what’s going on at the farm, without even having to go into a menu. Farms can also be upgraded with exercise equipment or other things, which help progress their evolving faster. Also, the game made creating the same Digimon multiple times actually worthwhile. Since Digimon are made of data, they have multiple evolution paths, not just one path like Pokemon. So, you could get a Botamon or Tokomon and digivolve them to familiar monsters like Patamon. You could also decide to go in an entirely different direction for their Rookie form. However, then go back to say Angemon for the Champion form. Each digivolution also has their own needed statistics as well. So, there are specific things to pay attention to, if you want a certain monster. 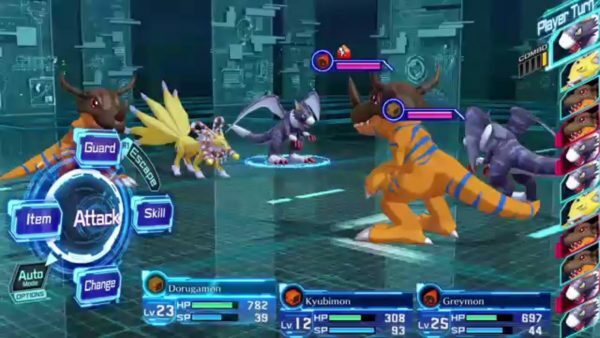 Battles feature 3-on-3 affairs, which include the first three Digimon in your party. The cool thing about the battles was the strategy involved. You could decide to bunch all of your Digimon together and hit support and group attacks. However, enemies can also take advantage of this. So, you may have to go with the more defensive spread out option, which allowed for more long-range shots. The only things that stood out to me as negatives are the graphics which look like they belong on the Gameboy Advance. However, the sprites still look good overall. But the battle animations are a bit lacking. The music is also kinda just there. I also found the story was kinda meh here too. A lot of your time is spent doing quests out of one hub. You can also increase friendship with your own Digimon by doing quests for them. This is certainly one aspect that’s improved immensely later on in the list. But at least they got training, battling and raising streamlined. Without making it overly cumbersome. These games are basically a spiritual sequel to Digimon World DS. A lot of the same mechanics are carried over from the previous game. Not saying that’s a bad thing at all because honestly, it’s not. 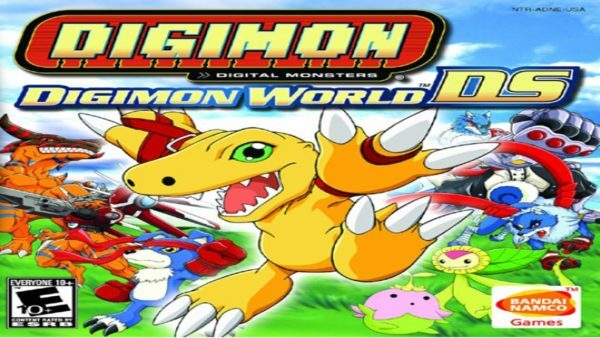 When Digimon World DS is perhaps the best Digimon game ever released up to that point, why change the formula. So, what you do get in these two games are virtually the same. The differences come from what Digimon you start with at the beginning of the game. For example, Digimon Dawn has Holy, Dragon, Water and Bird Pokemon, as the main focus. While Digimon Dusk focuses on Insect/Plant, Machine, Beast, and Dark. Eventually, any type of Digimon can join the party, but for the start of the game, the dungeons feature primarily these monster types. 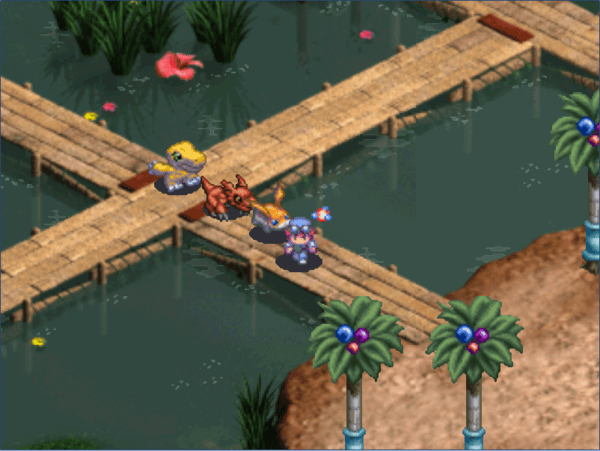 Digimon Dusk also brings back the 2D graphics. However, the battle animations are much better in this one. The music and sound effects are also improved. Probably because Bandai Namco learned a lot from the first game and had more time to play around with the DS. Perhaps the biggest issue, which is quite honestly the main issue for most Digimon games, is the lackluster story. This was one felt like it had much more focus on questing than even Digimon DS did. 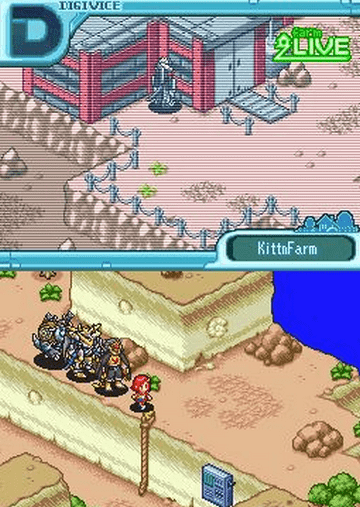 After seeing an evil being attack the starting area and lay waste to humans, the terrain and force de-digivolutions for many Digimon, the rest of the game is split into quests. There are type quests, which help level up that type stat for any Digimon of say Dark type. Then, there are main story fetch quests done out of a hub. If it wasn’t because of the battles being entertaining, which once again use the same strategy element described in my Digimon DS blurb, and the advancements to the DigiFarm, it may not place this high. However, it provides a better package than Digimon DS because of some of the improvements. The DigiFarm is fully customizable here, including changing the floor tiles and background music. Digivolving is more nuanced too. Digivolving presents a strategy in that once you go to the next form, they go back to Level 1. Basically allowing you to raise them how you want. But you can even de-digivolve them to make them even more powerful. So, if you like the monster collecting aspect there’s a ton to do. There’s also harder dungeons and enemies to fight later in the game. 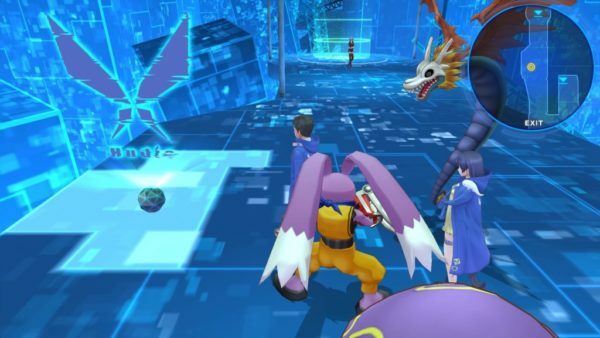 Plus, Digimon Dawn & Dusk have a more realized multiplayer, letting you do almost everything through the WiFi Connection. After Bandai Namco released Digimon World Championship, which is really just a return to the virtual pet raising type game. Weird that this always seems to be Bandai’s response after a more straight RPG title. The main thing is, ever since 2008, Digimon remained rather quiet in the West. Except for another spinoff brawler (Digimon: All-Star Rumble in 2014). So, when Digimon: Cyber Sleuth released a few years ago, it was met with some great expectations. The main draw of Cyber Sleuth is that it actually does something the other Digimon games don’t do well, have a story that’s actually very engaging. A glorified online space called EDEN exists that allows for people to do almost anything imaginable in a digital space. There are those that work in EDEN. While others use it as a chat service. Suddenly a mysterious hacker presents the silent main character with something known as a “Digimon Capture Device.” Since in this world, only hackers use Digimon. Usually for their own personal gain. I’ve recently been replaying this game in anticipation of Hacker’s Memory releasing soon. Again, purists may feel that the pet raising games are the “true” Digimon titles, and think this is too modernized, or goes too much into RPG territory. However, it isn’t a stretch to say this is the best Digimon game in existence. 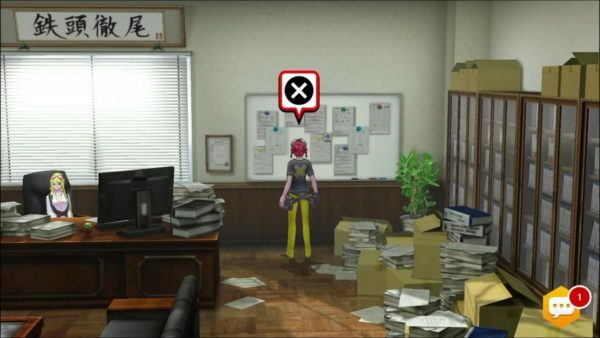 The game has the subtitle “Cyber Sleuth” because this eventually becomes your job. The main character is basically an assistant detective for a private agency run by a woman named Kyoko. You are tasked with venturing around a version of Japan, which also contains real cities like Shinjuku and Akihabara. While doing so, you talk to people to get clues, which usually leads to going back into Eden and stopping an evil Digimon. The story itself takes various twists and turns, as you uncover the truth behind the creators of EDEN and their true intentions. Traversing the cities is rather segmented kinda like in the Persona games, or the Akiba series from XSEED. Investigating is never challenging and everything is basically just a way to move the story along. Again, this is not anything groundbreaking, but it is great progress for Digimon games. Giving fans something they can actually sink their teeth into, aside from just collecting monsters. 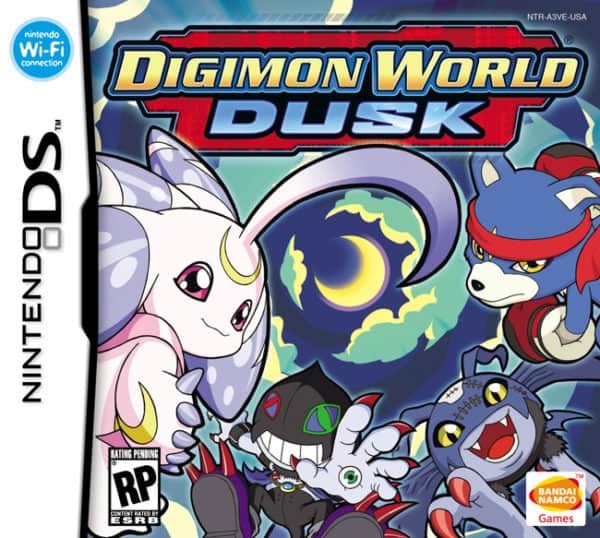 The monster collecting part is almost exactly the same as the Digimon DS & Dawn/Dusk games, which is fine because that part of the games was never an issue. 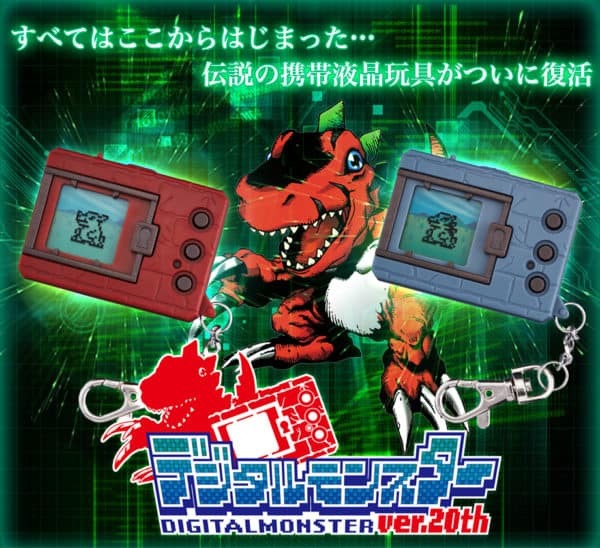 You have a DigiFarm, a DigiLab for digivolving, and there’s still all sorts of evolutions for each monster. It even tells you what stats and level you need to digivolve them into certain monsters. However, unless you’ve evolved them into that form previously, you only get their silhouettes, which may make some angry that want to follow evolutions from the anime. Especially, because some of the pictures can look very similar. So, you may pick the wrong one. Causing you to de-evolve them and then have to level them up again. Finally, battles are more streamlined, so gone is the strategy element of the DS games. Now, it is all about types (vaccine, virus and data) along with elemental strength and weakness. Some of the elemental stuff doesn’t always make sense. For example, Digimon of the same elemental type can do just as much damage to each other, as the one its weak against. If you carry around a strong party, much of the walking around dungeons will be a breeze, but bosses create some challenge. At least the game is always rewarding you with increases in levels for the Digimon and there are chests to find in the dungeons too. 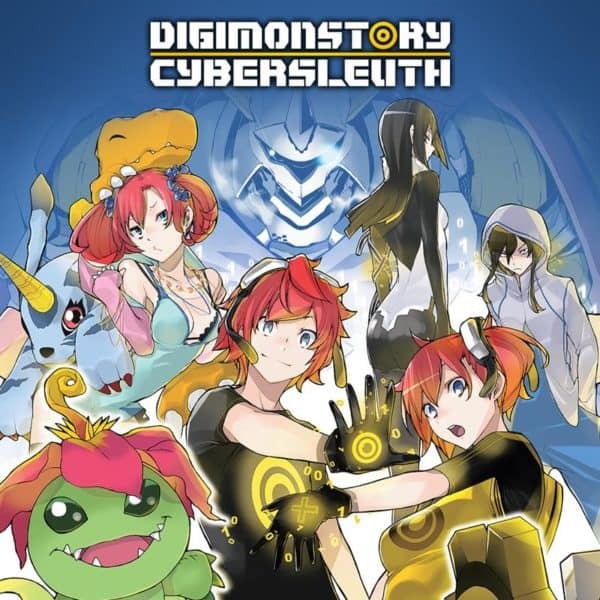 There’s just so much to like about Cyber Sleuth, even the pretty cool soundtrack too. Unlike the Pokemon games, which are mostly accessible. 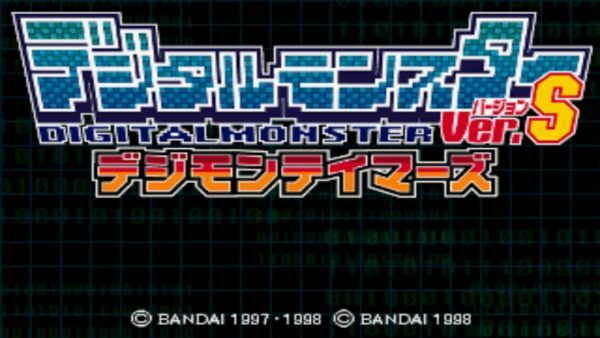 This is probably the only Digimon game I can recommend to casual or non-Digimon fans. It is amazing that even though Pokemon has majorly outclassed Digimon in the games department, Bandai Namco and the crew never give up. Obviously, the franchise is still very lucrative, so they have no reason to either, but it is encouraging with Digimon Tri existing in anime form, and Bandai making a sequel to Cyber Sleuth that they seem to be capitalizing on the best things about the series. Hopefully, you enjoyed this look at some Digi video game history, relived some memories, or are just angry your favorite game isn’t on the list. Whatever the reason, thank you for reading. Sean Garmer brings almost two decades of experience in the online Journalism field to W2Mnet. As the Editor-In-Chief, Sean is sort of the overseer of all the things that go on with the website. He rallies everyone together for group articles, makes podcast and video posts, and obviously edits most of the fine work seen on the site. Sean also hosts four out of the five major podcasts on the W2M Network. Wrestling 2 the MAX, Soccer 2 the MAX, Football 2 the MAX, and Video Games 2 the MAX. He also spends a lot of his time reviewing video games too. When he's not busy here or at his other job, he's spending time his daughter.